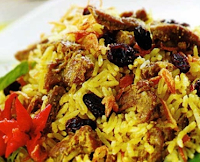 How to Make Delicious Cuisine Rice Kebuli .From a variety of refined cuisine middle eastern cuisine turns out there is one that is favored by the tongue of Indonesia is rice kebuli. Kebuli rice is stir the spices and mutton are cooked together with rice and coconut milk and raisins to generate additional aron. Then aron that have been made ​​are then steamed rice kebuli ripen to become ready. Processed rice dishes kebuli is quite delicious and savory, so invite interested people to enjoy it. In fact, not uncommon in certain events such as the celebration of the birthday of the prophet and Isra Mi'raj in the month of Rabi al-Awwal and rajab Muslims besides commemorating the great days of Islam were also present kebuli rice as his special treat. Here is how to make delicious kebuli rice dishes that you can emulate the steps of manufacture. Heat enough oil in a skillet and cook seasoning ingredient that has been mashed together with an additional bay leaves, lime leaves, lemon grass, cardamom, delicate flowers, nutmeg, cloves, and cinnamon and salt and toss well bubuhi. Let's maskan ripe seasoning. A subsequent add spices cooked with mutton, stir again and wait until the dishes of goat meat color changes. After that, add the rice dishes, stir well. Furthermore, pour the milk into the cooking then followed with a sprinkling of raisins, stir well and let the rice which is incorporated into the cuisine to be aron. Lift the aron and enter into steaming. Let stand for 45 minutes in length or until cooked in the steam and remove it. Combine aron with cumin oil and mix evenly. Kebuli rice has been completed and ready to serve. 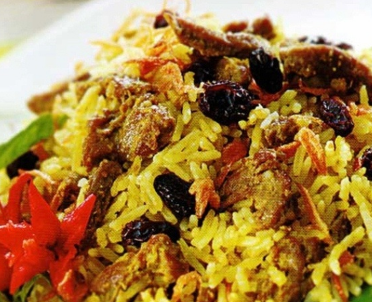 Various mixtures of materials contained on rice kebuli like mutton, raisins and spices makes it no longer need to be accompanied with other side dishes. But you can still add a complementary dish to further enliven kebuli rice treats are made. 0 Komentar Untuk "How to Make Delicious Cuisine Rice Kebuli"